Plants are the most effective way to increase oxygen levels in the room and improve air quality. There are also beneficial plants that will help you improve mood, and fight anxiety, depression, and prevent panic attacks. Researchers have found that there is a direct link between stress and oxygen levels and showed that high levels of toxins in the air lead to anxiety and stress. Therefore, you can drastically improve your mood and relieve stress and anxiety. Scientists have conducted studies on mice and discovered that the aroma of jasmine plant and jasmine essential oil significantly calmed them, and made them stop all activity and sit quietly in a corner. Their brain scans showed that jasmine fragrance boosts the effects of a chemical called GABA on nerve cells, and thus relieves anxiety and encourages rest. According to Professor Hanns Hatt, these findings published online in the Journal of Biological Chemistry can “be seen as evidence of a scientific basis for aromatherapy”. Researchers found that jasmine is much more effective than sleeping pills, anti-anxiety medications, and sedatives, as it increased the GABA effect by more than five times. “Research at Wheeling Jesuit University by Dr. Bryan Raudenbush, assistant professor of psychology, shows dispensing jasmine odor into a room where participants were sleeping “led to greater sleep efficiency and reduced sleep movement.” The research showed a greater quality of sleep even though there wasn’t more quantity of sleep. 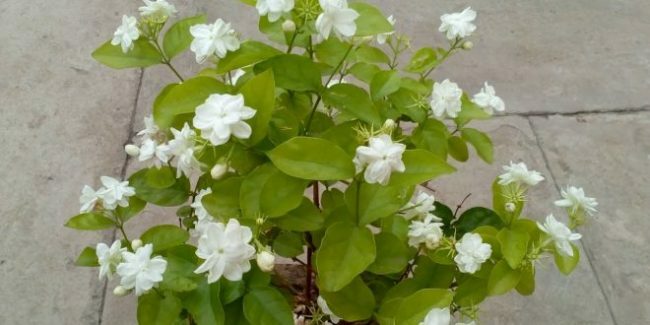 Therefore, keep a jasmine in your bedroom, and you will reap all the benefits of this amazing plant!